In the WNY region, our grow seasonal is short but plentiful. If you know what you’re looking for, you can find a wonderful selection of less-common, locally-grown produce to build your meals around. Here are some of our favorites – all of which will be coming into seasonality in May and June! Chard, often called Swiss Chard, actually has quite a long season in the area. It’s in the same family as beets, and this hardy green can withstand colder temperatures. Chard is beautiful to look at, cooks quickly, and is wholly edible (don’t throw away those stems!). Baby chard is a great addition to any green salad, but it’s also wonderful in hot dishes. This dish is a perfect base to start creating your own lunch or dinner recipe (just add protein! ), or a tasty side that packs a healthy punch. If you’re not ready to dive into chard headfirst, this is a great chard-novice recipe to figure out if you want to continue finding ways to incorporate this nutritious leafy green into your meals. This delightfully fresh salad is best as a side or as a palate cleanser between heavier courses. All the color, crunch, and lightness you can ask for! If you prefer your fruits to stay on the sweet side of life , you’re not alone. These red currant muffins are great for breakfast, dessert, or any time you need a sweet snack! Fava beans are a labor of love. Before they can be eaten, they need to be both shucked and peeled, a two step process. But the hassle is worth it for the buttery beans inside. Here’s your guide to prepping fava beans. You can also blanche them and peel them that way – whatever method you find most effective. Simple and delicious. The first few steps of this recipe are blanching and peeling the beans, so skip those if you opt for the frozen method linked above! This recipe packs in a whole lot of spring! Fava beans, asparagus, chives, arugula, watercress and shallots are all springtime foods in WNY! Garlic scapes have a short season in this area. They’re the curly shoots of regular garlic, and they are harvested to allow the garlic bulbs to flourish. They offer a unique garlicky taste with the freshness of green vegetables. You can use garlic scapes in place of garlic cloves for most recipes, but here are a few that really make the most of this unique ingredient. Garlic scapes are a main seasoning, a cooking vessel, and an eating utensil. Now that’s what we call efficiency. What a cool ingredient! Is there anything that isn’t delicious when it’s wrapped in bacon? This recipe is simple, and a great way to introduce garlic scapes to your meals! Kohlrabi is an alien-looking member of the cabbage family, but it’s more of a cross between a radish and a carrot. Both the bulb and the stems are edible, and it can be cut into sticks and eaten raw or cooked. Kohlrabi might be the most versatile vegetable you didn’t know to eat! Pair kohlrabi with apples for the perfect spring picnic or potluck dish. If you’ve never tried kohlrabi, you might be surprised by it’s unique flavor. Kohlrabi is sturdy enough to be fried. Try this (much) healthier alternative to a standard potato fry, and add the seasoning of your choice! Morels are highly seasonal, and, to be frank, more of a luxury food item. When you feel like a springtime splurge, these conical, meaty mushrooms elevate any meal. They’re light and hollow, so don’t let the per pound price floor you, but be sure the ones you buy are bouncy, rubbery and aromatic..
Do a little research before preparing, as morels can’t be eaten raw and shouldn’t be washed. Morels and leeks are a wonderful spring flavor combination, and these quesadillas are quick and easy to whip up. This quick and easy recipe keeps the earthy flavor in tact, but heightened with butter and soy sauce. 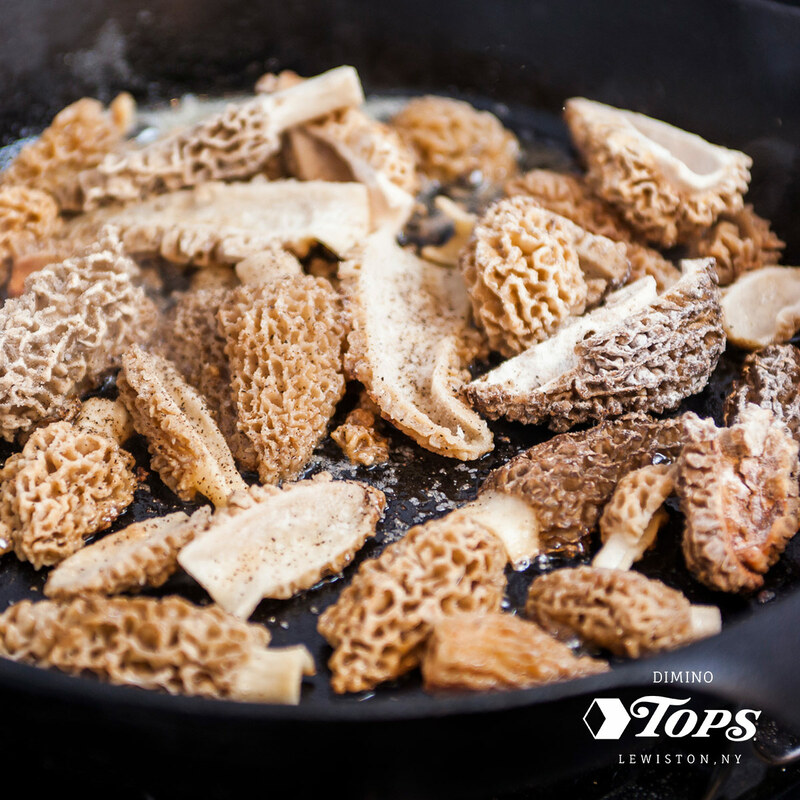 You can also find a great guide on buying, cleaning and cooking morels. Parsnips may look like weird carrots, but this tapered winter root vegetable is actually sweeter and nuttier. By late spring, parsnips are at the end of their season, so now is the time to pair them with delicious spring options. Aside from the fact that a buttery, cheesy topping makes any vegetable taste good, this creamy recipe brings together many of spring’s best offerings. This recipe can be easily altered to include more or less parsnips, as desired. It takes about 35 minutes, but most of that is roasting time – this roasted vegetable dish is about as easy, and tasty, as they get. Ramps are part of the onion family. They look like scallions, but they have a more garlicky taste. Ramps have a short season and only grow in the Eastern US and Canada, so use them while you can! The beauty of this recipe is that it can be made for any meal, and you can substitute your own favorite types of peas and mushrooms, or add more seasonal vegetables! Yum! These biscuits are so easy to make, it’s possible you already have everything you need in your pantry. Just add ramps. You’re probably familiar with the standard strawberry rhubarb pie (which is, in itself, among the best that the pie world has to offer), and maybe even a tart rhubarb crisp. But what else can you do with this red celery-like stalk? Shortbread crust, gooey filling, tart rhubarb mixed with sweet custard? Yes, please. You probably had no idea that rhubarb and pork are a culinary dynamic duo. The sweet tartness of the rhubarb is the perfect compliment to bring out the sweetness of the pork loin. Enjoy! What is watercress, and how do you eat it? Watercress is a slightly spicy green that traditionally goes best with game meats – but that doesn’t mean it’s not an excellent base for many spring salads. Peppery watercress combined with sweet apples and rich avocados, it’s a perfectly balanced salad. Hello, spring! If you’d rather your salad be the main course, this rustic duck salad brings a unique explosion of flavor and color, two of the best things about spring! What are your favorite seasonal spring recipes? Tell us on Facebook!